Whether you travel across town or to another country, Cancun destination weddings are an excellent way to have a beautiful location and amazing memories for your wedding. One of the things that many brides are doing after their weddings is a trash the dress photo session. This type of session is sometimes referred as “fearless bride session” and will usually be shot in a location that can contrast the elegance of the bridal gown, or other formal dress. The most popular location for this type of shoot is the beach, but you can also find examples of sessions in jungle areas, cenotes, caves, or even a pool. This can be a very popular thing to do during your Cancun destination weddings because you can show off the fun activities that you are doing while showing that you are not afraid to get your gown dirty to have a bit of fun. 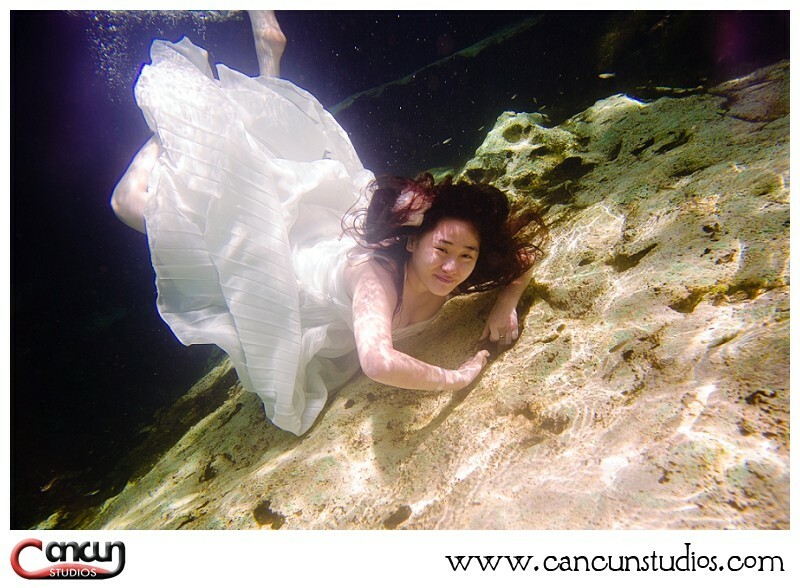 Cancun destination weddings and trash the dress photo shoots can be fun and beautiful, so you will want to choose a photographer who is as passionate about capturing the little moments as they are about capturing the formal poses. This passion will help you find the beautiful little moments that you may have missed while walking down the aisle or standing in the reception line. As you plan the details for your special day, don’t forget Cancun Studios is the most trusted name in professional photography in Cancun.